Pearls Immune™ / 30 caps - Nature's Way®. Why take a probiotic with lactoferrin? Because the majority of your immune system is in your digestive tract. Plus, like our other Probiotic Pearls supplements, True Delivery™ Technology guarantees the active cultures survive stomach acids, arrive in the intestines, and remain alive throughout the entire shelf-life. What is the outer coating of the Probiotic Pearls® Immune made of? Why does Probiotic Pearls® Immune active cultures contain only 1 billion bacteria? Some other probiotic supplements contain several billion. Our company offers many different probiotics in different amounts to suit different needs. Probiotic Pearls® Immune offers 1 billion cfu, the general daily recommendation, in a tiny pearl-shaped capsule. This amount confers health benefits because the probiotics are protected from heat, moisture, and stomach acid so they can arrive intact in the intestines. What is the color of the Probiotic Pearls® Immune capsule? Unlike the original Acidophilus PearlsTM active cultures, the Probiotic Pearls® Immune capsule is brownish pink in color. Probiotic Pearls® Immune contains lactoferrin, an iron-binding protein, responsible for the brownish pink color. Does the lactoferrin in Probiotic Pearls® Immune contain iron? Lactoferrin is a powerful immune-enhancing protein, first isolated in milk.† Because of its high affinity for iron, lactoferrin will retain a small amount of iron—very small. For all intents, the highly concentrated brand of lactoferrin found in Probiotic Pearls® Immune is essentially iron-free. 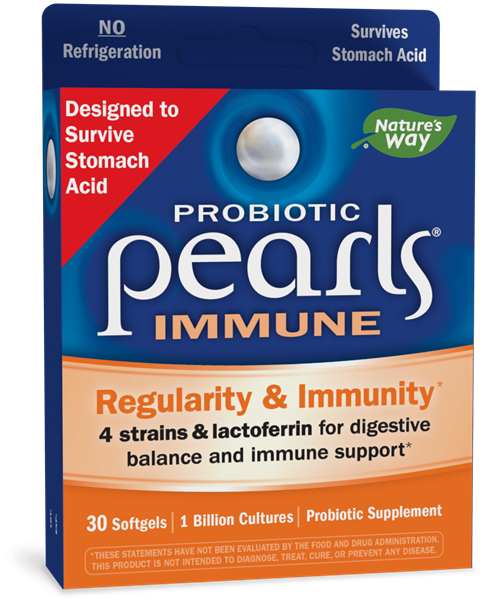 Does it matter when I take Probiotic Pearls® Immune?